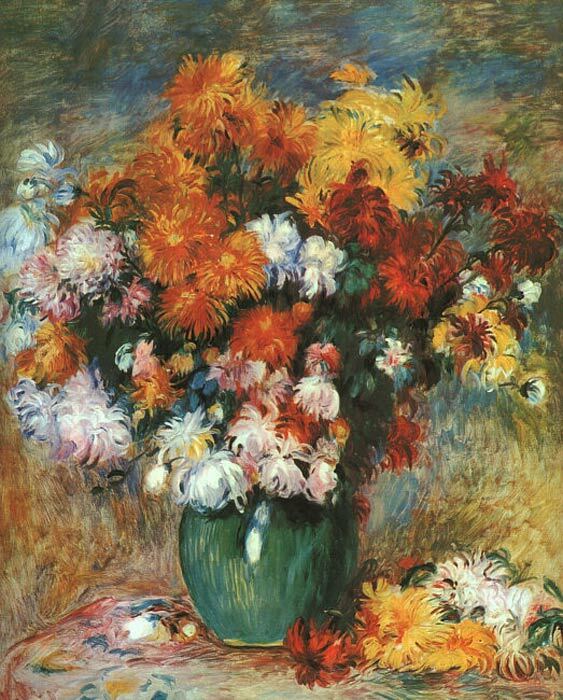 This painting of Renoir- Vase of Chrysanthemums (1895, Musée de Beaux-Arts, Rouen), is one of the many still lifes of flowers and fruit he painted throughout his life.Other notable examples of exploring this genre - still life, is Fruits from the Midi, 1881, Arum and Conservatory Plants, 1864 and Bouquet, 1885. SPECIAL NOTE : The painter will make the reproduction as close to the original oil painting as possible. If you want your painting to alter from this likeness, please email us and " Vase of Chrysanthemums " will be reproduced according to your special requirements.